Precision parts, including tapped and quick-connect terminals, in a wide choice of materials are a specialty of Deltran. 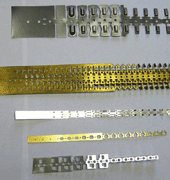 Stainless steel, nickel, nickel silver, all of the brasses and bronzes, plus a wide selection of special alloys used in the electrical and the electronic industries are daily stamped into blanks, tapped, and complex shaped parts. Our modern facilities and experienced personnel join together to provide a complete source for your precision metal stampings. If your metal stampings require accurate tolerances and consistent quality, or if you have a problem part that requires special attention, please call us. We would welcome the opportunity to help. Deltran has perfected a method of producing, in one operation, terminals and other stampings incorporating tapped or threaded holes without sacrificing quality. High standards and close tolerances are consistently maintained throughout this unique stamping/tapping procedure. The savings realized are obvious. Costly secondary tapping operations are eliminated. Your cost for tapped terminals or threaded stampings, made to your specifications, are approximately the same as the price of the stamped part alone. Deltran produces solid and composite contacts in all sizes and configurations, except rivet types. All are made in strict conformance with the most demanding specifications and are available in a wide variety of metals, alloys and composite materials such as overlay, stripe and toplay. Quite often a contact assembly you are now using can be replaced by a single part of a composite stripe or toplay material. 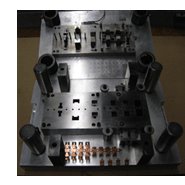 The resulting elimination of your secondary assembly operation can reduce costs and increase design efficiencies. Write us regarding your contact parts and assemblies. We would welcome the opportunity to quote on even your most troublesome application. Send your drawings or prints, if possible, and we will answer all inquiries promptly and courteously.